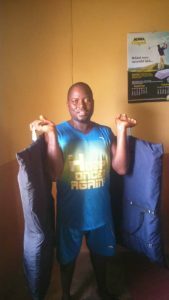 Benison Dry-cleaning and Laundry Services commenced operations in October 10, 2011.The business is very lucrative provided you can be committed to it. Our service has lot of division like sorting of clothes, washing, drying, ironing etc. Another aspect of the business is pick and delivery and that has been our major concentration. Our targeted customers are those that are too busy to put their cloths in proper order for instance, bankers, businessmen and businesswomen. What is your motivation as an entrepreneur? From childhood, I have been assisting my uncles due to their schedule to dry clean their cloths. Dry-cleaning has been my hobby, now; it has become my major source of income. Nigeria economy is another motivation that prompted me that l can be a job creator and not a job seeker. What were your challenges at the initial stage? The challenges l experienced at the initial stage as an entrepreneur is enormous. The first challenge was funding. I consulted a friend of mine on how to establish a dry cleaning business; and he told me to go and raise N2.5million. I had to encourage myself to start small. Interrupted power supply is another challenge every entrepreneur battle with. Stressful delivery due to lack of delivery van. Delay in payment and counter offer in term of customer not accepting my price. How can young people improve on themselves? Young people can improve on themselves by knowing their purpose in life and having a good mentor that can guide them right. Prayer should not be exempted out of their dictionary.